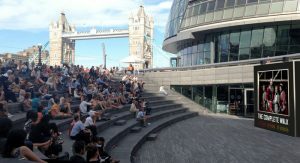 In addition to 1616: A Momentous Year—a series of readings, family events, exhibitions, conferences, productions, and lectures—the London Globe showed 37 new 10-minute films on 37 outdoor screens to mark the occasion along a 2.5-mile route from Westminster Bridge to Tower Bridge (“The Complete Walk”), and an international Shakespeare festival is being planned in Shanghai for fall 2016. These films are shot on locations that are perceived to align with the settings in the plays. For example, “Cleopatra beside the Pyramids,” “Shylock in Venice’s Jewish ghetto,” and “Hamlet on the rocks of Elsinore.” The Globe’s publicity material emphasizes that the series aims to capture “the astonishing breadth of Shakespeare’s global imagination” (Around the Globe, 29). Shakespeare is our contemporary because the actions and objects from the worlds of Shakespeare overlap with and affect those from our worlds. Two of the most iconic props, Othello’s handkerchief and bed, are transformed into an eroticized red pattascarf that doubles as ceremonial wedding sheets in the South Indian film Kliyattam(dir. Jayaraj, 1997) to signify fertility and life and, in turn, to highlight the lack thereof. Tracing the journeys of such tokens sheds new light on the role of the handkerchief in Othello and Shakespeare’s place in the cultural marketplace. Multiple festivals have centered their entire branding effort on Shakespeare, including David Garrick’s Shakespeare Jubilee in 1769. In modern times, Denmark’s Elsinore, Kronborg Castle, has been marketed as “Hamlet’s castle” since the twentieth century. The annual Hamlet-Sommer festival and its site-specific performances of Hamletat Elsinore make the castle a self-fulfilling myth and product that comes full circle. Is Shakespeare a Universal Currency? Is Shakespeare a universal currency in world markets? Shakespeare’s plays are not universally valid, but rather endlessly adaptable, making “Shakespeare” current and useful. Shakespeare is far from a tabula rasa. Shakespeare remains alive today in large part because the canon has become a self-validating, self-regenerating commodity in the global cultural marketplace. Imaginations of Shakespearean universality do not beget monotonic, repetitive, fossilized performances. Each culture and generation rebrand Shakespeare as their own, just as Shakespeare uses existing words in new contexts (e.g., “manager of mirth” in the entertainment business in A Midsummer Night’s Dream). Shakespeare as a brand and an “archive-worthy” collectible is driving the growth in diversity in the entertainment industry while simultaneously sustaining traditional aesthetic values associated with classical literature. Indian music in British director Tim Supple’s production of Twelfth Night(2003) helps to construct the aural landscape of a British Ilyria while signifying the different origins of Viola and Sebastian in the adaptation. Meanwhile, Hamlet as a figure of thought keeps turning up in unlikely places, ranging from a filial, patriotic prince in a Confucius temple in mid-twentieth century China to a procrastinating politician in Germany and the USA (often without the Yorick’s skull). Taken out of context, Ophelia has become a commercialized commodity associated with joy and modern life, as shown in high-thread count cotton beddings sold in Taiwan. Karl Marx sees a commodity’s exchange value—something defined relationally on the market when traded—as something that is independent of their use value (the value of utility). The exchange value of Shakespeare is reflected in uses of Shakespearean artifacts in cultural diplomacy and venues where nation states project soft power. In October 2015, during Chinese President Xi Jinping’s state visit to Britain, he quoted The Tempest, “what’s past is prologue” (2.1.253), to British Prime Minister David Cameron, and urged the two countries to “join hands and move forward” despite the antagonistic history between them including the Opium Wars. Significantly, Xi received a collection of the sonnets from Queen Elizabeth II as a gift during the state banquet. 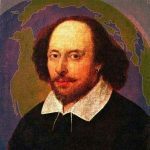 Oftentimes when Shakespeare is referenced or quoted in the global marketplace, the passages are given an ethical burden and curative quality which contributes to the Shakespearean myth. For example, Al Pacino not only quotes from Shakespeare in his film Looking for Richard (1996) but also cites, in a larger context, the American admiration of Shakespeare and anxiety of not being qualified enough, whether by birth or upbringing, to “get it right.” The citational quality of Shakespearean adaptations hinges on the mystified idea that the plays offer a moral high ground across time and culture. The multiple, transtemporal and transhistorical worlds of Shakespeare are the subject of this special issue, which draws upon the papers presented at the conference on Global Shakespeares: Mapping World Markets and Archives(George Washington University, January 24-25, 2014). There are no world markets without archives built on collective cultural memory. Conversely, there would be no archives without the cultural marketplace to validate that Shakespearean artifacts are archive-worthy in the first place. These two issues have to be considered together. In digital and analogue archives of cultural globalization, Shakespearean memorabilia and performances play an important part as well. The archives reflect and inform marketing strategies that keep Shakespeare relevant, compelling, and profitable. As Jonathan Arac theorizes, globalization as a cultural process that “opens up every local, national or regional culture to others” and produces ‘many worlds’” (35). While there are several vetted, curated visual and textual archives, YouTube has become an “accidental archive” without centrally controlled curatorship (O’Neill 11). A system of user generated videos that are buoyed by an ad hoc tag cloud, YouTube both reflects and influences the ebbs and tides of global Shakespeare. Shakespeare in world markets is buoyed by the large number of professional and amateur digital videos circulating on various platforms. Digital videos, in contrast to analogue videos, are non-linear. As a non-sequential medium, digital video allows instant access to any scene in a performance and encourages a non-curatorial approach to the archive. While videos are only partial witness to live performance events—recording only what the camera operator chooses to see, they are performance events in their own right when viewed and re-played online. Collocations and collections of digital videos thus form their own ecosystem—a marketplace of ideas and an archive of possibilities. With this in mind, the contributors map the itineraries of Shakespeare films, productions, objects, and interpretations in world markets in South Africa, Bollywood, and world music (including music from former British colonies). We also map the movement of various motifs and agendas in cinematic soundtracks, music in stage productions, and images of Hamlet constructed by the American Communist Party, and how the histories of these motifs intersect within such ad hoc archives as YouTube, and within curated and vetted archives such as Bardbox and MIT Global Shakespearesopen-access digital performance archive. There are several high-profile instances of global Shakespeare being tapped for its market value in 2014, the 450thanniversary of Shakespeare’s birth, and in 2016, the quatercentenary of Shakespeare’s death. Worldwide festive activities in 2016 surpass in number, scale and enthusiasm of those in 2014. Sujata Iyengar has coined the term “deathiversary” in reference to the cultural phenomena surrounding Shakespeare’s 400thanniversary, a term that highlights the commemorative obsession with Shakespeare’s death. Tang Xianzu, Miguel de Cervantes, Francis Beaumont, and Philip Henslowe all passed away in 1616, and 2016 marks the 500thanniversary of the publication of Utopia, but for numerous reasons Shakespeare took the spotlight. Theatre companies, festivals, publishers, academic institutions, and even restaurants, seize the opportunity to increase their cultural capital, profit (as the case may be), and visibility by offering public events around Shakespeare, and particularly Shakespeare branded as a global author. Quantifiable impact on society is a particularly coveted criterion for assessment in the UK. Site-specific performances and events add to the market value of “Shakespeare.” The Folger Shakespeare Library is touring its First Folios to all fifty U.S. states, Washington, D.C., and Puerto Rico. King’s College London heads a consortium called Shakespeare400 for a year of programs, performances, and exhibitions. Shakespeare is apparently not only food for thought. The Shakespeare 400 Chicago festival offers, among other events, the year-long Culinary Complete Works, a “complete culinary tour of the … plays through the vibrant and diverse restaurant scene.” Examples include fares that “channel” A Midsummer Night’s Dreamat Topolobampo and Tony Mantuano’s interpretation of Romeo and Julietin Cafe Spiaggia. Many of these festivals share similar approaches to marketing global Shakespeare. The 2016 festival in Chicago echoes the international spirit of the ambitious World Shakespeare Festival during the 2012 London Olympics. They even feature some of the same touring productions. For instance, Chicago-based Q Brother’s Othello: The Remix, Mumbai Company Theatre’s Twelfth Night and Belarus Free Theatre’s King Learwere featured both in London in 2012 and in Chicago in 2016. Other international foreign-language productions touring to Chicago include Cheek by Jowl’s Russian Measure for Measure, Shanghai Peking Opera’s The Revenge of Prince Zi Dan(Hamlet), Mexico Foro Shakespeare’s Enamorarse de un Incendio, and Poland’s Song of the Goat’s Songs of Lear. Commodified commemoration is a paradoxical genre, because these festivals “remember Shakespeare best when [they] make him new” (Calvo and Kahn, 14). Everywhere we look, there are signs that Shakespeare is taken as a spokesperson for the human in many parts of the world, and a high value currency in world markets of cultural goods. The London Globe is currently touring Dominic Dromgoole’s production of Hamletto some 200 countries and territories. Writing for the Economist,journalist Jasper Rees observes that global Shakespeare shows us that while “cultures may find reasons to be at one another’s throats, there is something primordial that binds all of us: the human need to stand up and tell stories of love and death.” When Dromgoogle’s 12-actor Hamlettoured through Africa, Annastacia, a 16-year old girl, traveled 60 kilometers to Kasane, Botswana, with her school group to see the show. The message she took was this: “In our culture when somebody marries his brother’s wife this is dangerous because children end up doing mistakes in life” (Rees). The Botswana reception of Hamletbrings to mind renowned anthropologist Laura Bohannan’s account of her experience telling the plot of the play to the Tiv. Everything the Western critical tradition deemed morally problematic in Hamlet, the Tiv considered natural and logical (28-33). The “tribal” reaction to what Bohannan assumed to be universal in her own world at Oxford made her realize that “one can easily misinterpret the universal by misunderstanding the particular.” There may be a universal human capacity for morality, but each culture fills in the particulars. Presented here are six case studies with six distinct but interconnected methodologies to Shakespeare’s currency in world markets and archives. Despite their differences, the performances and marketing strategies we have observed share one common underlying principle: innovation. They do not present a frozen Shakespeare from four hundred years ago – fit for consumption today after reheating in the microwave. Rather, they embrace innovation and freely acknowledge that, as Robert Musil observes, anything permanent will inevitability lose “its ability to impress” (320-322). To map the itineraries of Shakespeare in world markets we have to first listen to the sound and sweet air of the plays in global contexts. Research on global Shakespeare has not paid due attention to the musical dialogues on stage and on screen. Kendra Preston Leonard’s article rectifies this situation by analyzing the musical landscapes of several productions and films that create musical dialogues between Elizabethan drama and the cultures of Britain’s (former) colonies. Tim Supple, for example, uses Indian music to signify the divide between a “British Illyria” and Viola and Sebastian’s origins in his 2003 Twelfth Night. Viola and Sebastian “travel” from East (cued by music of India) to the West (which is represented through music) which has long appropriated concepts of the East. However, Viola and Sebastian remain firmly rooted in the East. Music signifies multilayered localities: fictional and historical. Indian music again is used to frame a colonial past in the BBC’s Virgin Queen (2005) and Elizabeth: The Golden Age (2007). Music from former British colonies and a faux-medieval score are used in Eugenio Barba’s Ur-Hamlet(2006) to mark up cultural differences. Barba juxtaposes Saxo Grammaticus’ Latin narrative against more modern Asian music in Ur-Hamletin the multicultural production which features multiple performance traditions. World cultures that may appear to be “harmonious” on stage begin to appear contentious once the audience pays attention to the musical landscape. Leonard points out that the world music here reframes race and character in disturbing ways. One of the most frequently encountered questions in the study of global Shakespeare is the cultural and language barrier. Can one engage productively with global Shakespeare when one does not understand the foreign language? Echoing Leonard’s and Seef’s analytical methods, Sujata Iyengar demonstrates another productive approach to understanding otherwise inscrutable global Shakespeare. In her study of several Indian and Italian film versions of Othello, Iyengar suggests that when one does not understand the foreign languages (Malayalam, Khariboli, and Italian), one could be more attentive to the local roles of objects and props in global circulation and in creating and attributing agency—or what she calls “the life of things.” The films both indigenize and transform the most iconic object, the handkerchief, along with the bed of Othello and Desdemona, into a rhizomatic network connecting multiple sources of agency, characters, and meanings. Another important issue in the study of global Shakespeare is how to understand local and worldwide political histories, and how arts and politics intersect. Jeffrey Butcher’s study of the Leftists’ appropriation of the character and discourses of Hamlet shows that they used “Hamletism” (the act of applying Hamlet to national identities) to advocate international proletarian solidarity rather than promoting war. Butcher argues that the Leftist citations of Hamletout of context helped to develop a global proletarian identity. Complementing Burt’s theoretical take on the acts of collecting and interpreting letters as an archive, Christy Desmet takes a close look at various genres of digital archives. Specifically, she makes a case for the concept of curation as a central issue that distinguishes crowd-sourced archives from vetted, scholarly ones. Shakespeare has gone global thanks in large part to digital media. In “The Art of Curation,” Desmet theorizes YouTube as a crowd-sourced “wild archive” that resists the imperative for curation, and, by contrast, scholarly digital archives that are vetted, editorialized, and curated. The YouTube environment may seem free of the tyranny of the academic establishment, but it turns out to be somewhat monolithic. A basic search on Romeo and Julietin 2013 brought up mostly mainstream and Anglophone professional and amateur videos. Desmet reports that there are “surprisingly few examples of global Shakespeare.” Archives with intellectual backing such as the MIT Global Shakespearesand Canadian Appropriations of Shakespearemay have more vetted contents in a more global context, but they are not immune from the impulse of collecting, which is an act of self-enclosure. Desmet moves on to theorize digital interfaces across all of these genres of digital archives as a boundary space that organizes a user’s experience, rather than representing their experience. The interface has an important curatorial function with ideological effects that are sometimes overlooked. “Interface constitutes us as subjects,” cautions Desmet. Therefore, curation constitutes the archive. “Global” Shakespeares reveals just how intensely local all performances are, whether digital or analogue. The ideological encodings of all performances in all forms, including Anglo-American ones, should be studied within, rather than in isolation from, this broader context. Arac, Jonathan. “Anglo-Globalism?,” New Left Review(July–August 2012), no. 16: 35-45. “The Complete Walk.” Around the Globe62 (Spring 2016): 29. Bate, Jonathan. “The Mirror of Life: How Shakespeare Conquered the World,” Harper Magazine314. 1883 (April 2007): 37-46. Bohanna, Laura. “Shakespeare in the Bush. An American anthropologist set out to study the Tiv of West Africa and was taught the true meaning of Hamlet.” Natural History75 (1966): 28–33. Iyengar, Sujata. Personal correspondence with Lainie Pomerleau and Sarah Mayo, May 6, 2015. See also Sujata’s comment on a Facebook post on 19 February 2016; quoted with permission.